Val DiGiorgio is emerging as the front-runner to be the next Chair of the Pennsylvania Republican Party. Senator Pat Toomey announced today that he is supporting the Chester County Chair’s statewide effort. Val isn’t fit to be dog catcher. If you are looking for the slimiest candidate, then he’s your guy. He put all the $$$$ into two candidates, one lost, the other won and that will be a nightmare as he takes his orders from Jesus-directly. Because of this, Rep Dan Truitt lost his seat last week in a recount. If Val had split the money more evenly we wouldn’t have lost Van. He’s a county nightmare, don’t make him a state one. Probably most of these people want to get rid of him in the County and that’s why they support him. Slime. Having been active within the County Committee the last few years and getting to know Val and see his leadership up close, I believe he would make for an excellent state GOP chair. Val recognizes that the party benefits from having a diverse makeup to represent the practical conservative message of the party. This, in part, has made Chester County a great place to live and raise a family. Who would have thought the newly created 74th district would have a Republican representative? Val led the effort not to write off that district but to compete and utilize resources. When combining that effort with a great candidate like Harry Lewis, the Republicans won. That same mentality across the Commonwealth can only serve the party well. I am a committee person and I do my homework on everyone before I cast my vote. I don’t like how Val tries to influence people into voting for a certain candidate and thinks his caucus should vote in a “block.” This is done because of back door deals between party hacks (i.e., you vote for my candidate and I’ll vote for yours). I know for a fact this happened in the last Supreme Court race as I was part of the discussions. Look where that got us. Sadly, some of the committee people are just sheep and do what they are told, rather than be their own person and do due diligence on the candidates before casting a vote. I am not one of them. With that said, I don’t think Tabas is a very good candidate either. He is not a good people person, but he is not as corrupt as Val. My vote will be decided on the last day after I do more homework. It should be a close race from what I am hearing. good luck to both! 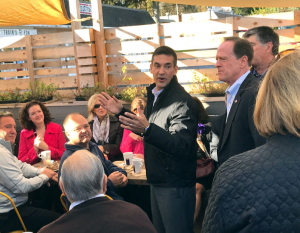 Does anyone know why Toomey came out for one candidate and, impliedly, against the other candidate? Val is a good guy but this puts him on a collision course with his wife’s employer Josh Shapiro. How does Val oppose the political opportunist Shapiro as he runs for the next office when his wife’s career is completely dependent on Josh? This should be fun to watch. I respect and have known both candidates for more than 25 years. My interests are from a grassroots and diversity perspective. I have seen Val go out and find the best database technology; utilize social media for every campaign and messaging; raise millions for local and statewide races; bring people together on an issue; listen attentively and openly to input that he might not agree with; reach out across the state to assist candidates who sought his advice and, something else that’s important–mend fences. He’s worked the polls on Election Day, gone door-to-door with candidates, put out literature and pushed plenty of wickets in the ground. He’s not establishment and is beholden to no one. He is passionate and always returns a phone call. He is a strong leader. I’ve disagreed with him, and I’ve agreed with him. He respects and seeks all input and then weighs it for the greater good. I look for broad experience, mutual respect and fairness. Val is that kind of leader. I can’t figure out why some people are so deeply offended by DiGiorgio putting himself out there and giving people a choice. How does that deserve any criticism, nevertheless nasty personal comments? Seems like Val, Senator Toomey and their supporters are the real courageous ones. Wonder why happens if Trump endorses Tabas. Will Pa GOP members follow their President or Senator? It must be true love. Toomey finally makes a strong commitment to somebody. if he is worthy is another matter. Val is young and competent. Looking forward to the shake up. And no. I’m not personally benefitting or a committee member. There’s a surprise – Not! Toomey tries to buy off the committee people then attempts to strongarm Tabas to drop from the race, and now he endorses DiGiorgio. I just hope the committee people have enough courage to do what’s right and see this for what it is. Politics at its finest here. What an embarrassment! Corruption at it’s finest here folks! Anyone that supports DiGiorgio does not truly know him or what he is all about. Just ask some of his ex-wives and girlfriends….wow!